The basic premise of the MSG150* is this: Over the next year or so we will eat lunch at every restaurant in Seattle's International District (aka Chinatown) and (a) collect interesting data, (b) write funny and useful reviews, and (c) make a million dollars. We will eat at all establishments who's primary source of income is food. This excludes coffee shops, total dive bars, and scary marts, but everything else is on the list. We will order typical lunch fare for each restaurant. We will try and eat the same sorts of things their regular lunch patrons appear to be eating. If we go to a restaurant twice, we will only write a review once (but reserve the right to re-review). We will eat at restaurants in a predetermined order. However, if the next restaurant cannot accommodate us when we show up, we will skip it for that day and come back to it on the next outing. All bribes must be divisible three ways. No jokes about being hungry again at 3 pm, unless you are offering to buy snacks. We make the rules so we can change the rules. 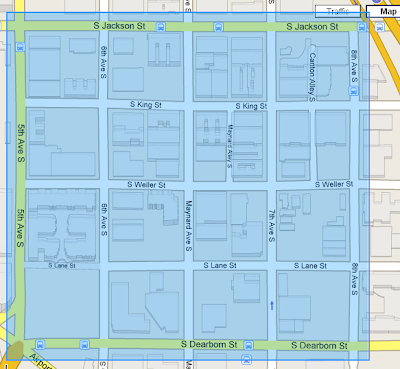 We will follow a yet-to-be-determined pattern starting at the NE corner of 5th and Jackson. 1 chopstick: dog food! - I'd rather eat my arm. 2 chopsticks: not so good - Not likely to go back. 3 chopsticks: average - Sure, if everyone's going I'll go along. 4 chopsticks: good - These guys are on to something. I'll be back. 5 chopsticks: great - Wow! A top 10 lunch spot. *Our apologies to the National MS Society. It's a great organization, but does a lousy five spice chicken.